Also checkout our buffalo version! optional: your favorite dipping sauce! Preheat oven to 425 degrees. Place a wire rack inside a baking sheet. Spray rack with cooking spray. Melt butter in a skillet over low heat. Add breadcrumbs and slowly stir until golden brown, about 5 minutes. Set up breading station by putting three shallow bowls on counter. Fill first bowl with egg and milk, second bowl with flour, and third bowl with breadcrumbs, salt and pepper. Cut chicken in to bite-sized pieces. Dunk chicken in egg mixture bowl, then flour bowl, then shake off excess. Place chicken back into egg mixture bowl, then roll in breadcrumb bowl, coating thoroughly. Press breadcrumbs into chicken and place on a wire wrack. 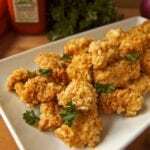 Once all chicken pieces are breaded, spray chicken with cooking spray. Bake for 10 minutes, until chicken is fully cooked (internal temperature of 165 degrees). Let rest for 5 minutes. Serve straight up or with your favorite dipping sauce!